Blue-whales in Isfjorden in June, polar-bears feeding on dolphins, a white humpback whale in the North Atlantic, and a polar bear cub riding on his mother's back to cross open water. These are some of the interesting sightings that cruise ship operators have seen and jointly reported to the scientific literature in partnership with the Norwegian Polar Institute (NPI). The valuable cooperation between the tourism industry and researchers is helping to increase knowledge about the Arctic environment during this time of rapidly changing conditions. Members of the Association of Arctic Expedition Cruise Operators (AECO) have reported marine mammal sighting observations to the Norwegian Polar Institute's Marine Mammal Sighting Data Base. This data-collection is resulting in new knowledge about marine mammals in Svalbard, and the broader North-Atlantic. Researchers spend a lot of time in the field in Svalbard, studying wildlife. However, the number of researchers is limited, the archipelago is large, and the summer season is short. AECO has members with expedition cruise vessels that circumnavigate Svalbard numerous times during a season. They visit areas researchers are unable to cover annually. Thousands of staff and passengers observe the wildlife and they share information on what they see with the researchers. Cooperation with the expedition cruise industry in the registration of marine mammal sightings has increased the number of eyes-on-the-ground enormously and resulted in a variety of interesting sightings and better base-line knowledge of relative densities and the timing of arrivals and departures of migratory species. The data collected by AECO has contributed to new maps showing the distribution of walrus haul-outs, bowhead whales and white whales in Svalbard. From time to time, the reports include new and exciting information. This has been the case with a report of a polar bear cub riding on the mother's back in an ocean crossing, observations of polar bears mating on the ice in June, polar bears feeding on dolphins and a white humpback whale being observed in the North Atlantic (previous records of such a color anomaly only exist close to Australia). These observations have all resulted in scientific publications. 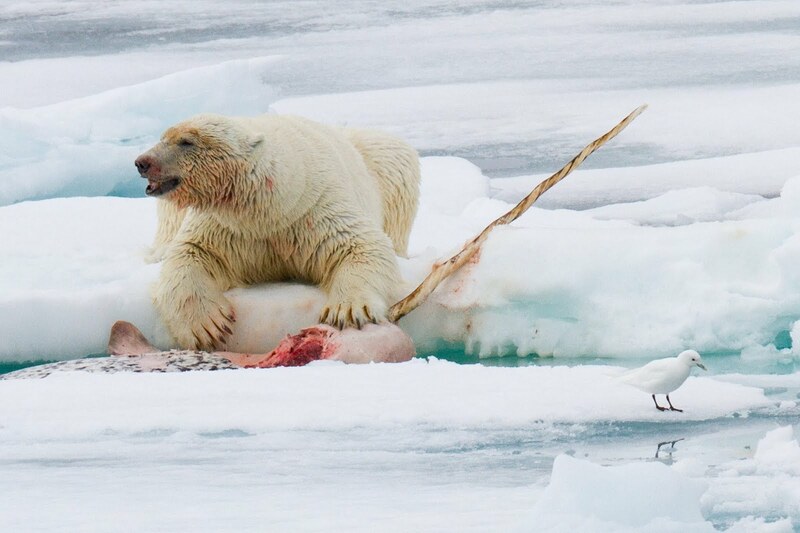 Polar bears feeding on narwhals north of Svalbard, an extraordinary group of bowheads and blue whales in the archipelago in late spring/early summer, are exciting observations from this year that will make their way into the scientific literature soon. NPI Arctic marine mammal researchers, Drs Kit Kovacs, Christian Lydersen and Jon Aars are using the data collected by the tourism industry to expand the global coverage of these animals during a time of rapid environmental change. "The data collected in cooperation with the tourism industry is very valuable to our work," says Dr Kovacs. "We really appreciate the efforts the industry is making in sharing their observations with us and helping increase knowledge about these animals in Svalbard, which is currently an arctic hot-spot that is changing 2-4 times faster than other areas," she adds. Frigg Jørgensen, executive director in AECO says: "We are really glad to have this cooperation between the tourism industry and researchers. It is an example of how tourism activities can be a resource for others, and how cross-sector cooperation can work."